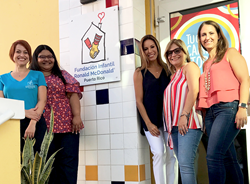 Claudia Barcelo, center, joined Thirty-One Gifts sales Consultants at the first Spanish Opportunity Event at San Juan, Puerto Rico, where they donated 500 welcome bags to the Ronald McDonald House. “We welcome women from all walks of life, and I’m thrilled we’re making the opportunity to own your own business available to even more women with diverse backgrounds.” Cindy Monroe, CEO, Thirty-One Gifts. Thirty-One Gifts is reaching out to more women to provide the opportunity to own their own businesses, and join the bond of sisterhood found among their independent sales field. Thirty-One’s mission is to celebrate, encourage and reward others for who they are, and to provide women with a fulfilling, enjoyable and rewarding experience. The company is working to share its mission with all ethnicities of its 61,000 sales consultants, and to welcome, support and empower more women from Latina and African American backgrounds. Thirty-One initiated its outreach at the request of their existing sales field, and is providing the tools and support they need to mentor, communicate and serve diverse individuals. Thirty-One Gifts was founded in 2003 by Cindy Monroe, and today is one of the world’s largest direct-selling organizations, with a sales field throughout the U.S. and its five territories, and Canada. The name Thirty-One comes from Proverbs 31, of the Bible, which describes the attributes and importance of a “virtuous woman.” Their product line includes purses, totes, home organization and décor, travel bags, baby bags, crafting organization and more, sold via their independent sales consultants at home parties and online. Thirty-One believes their mission, values and culture align closely with the strong faith and family values, commitment to community, and importance of personal relationships of Latinas. Both honor and celebrate strong women with serving hearts as well. Barcelo is leading the outreach to Latinas. She is a Mexico City native, Spanish-speaking, and has extensive experience in the network marketing field, having led tens of thousands of independent sales consultants with two other direct-selling companies, focusing on growth in the U. S. and Puerto Rico. By speaking with Latinas, and being a part of their community and culture, Thirty-One has opened the reach of their sisterhood by providing leadership, support and tools to assist a Spanish-speaking sales field. The company has established a complete website in Spanish, and has created sales materials – videos, an intranet for sales consultants, printed collateral and catalogs, training materials, a new enrollment kit and more – in Spanish. Their call center, which provides support to customers and sales consultants, is staffed with bilingual Spanish-speaking representatives as well. These tools support both new consultants and existing Spanish-speaking sales people to grow their businesses and support themselves and their families. Thirty-One’s Latina sales leaders have been asking the company to offer more materials in Spanish so they may grow their sales teams and communicate with their teams and customers more effectively. Barcelo is conducting several opportunity events in Puerto Rico, Florida, Texas and New Jersey, where concentrations of Latinas live. At the events, women learn about being a sales consultant at Thirty-One and meet staff and local Latina sales leaders. They also may join as an independent sales consultant for Thirty-One at the events. They often are combined with a donation or volunteer opportunity at a nonprofit organization with whom Thirty-One is aligned through their philanthropic initiative, Thirty-One Gives. At several Spanish opportunity events, Pink Heals, a volunteer-run nonprofit created and staffed by firefighters to provide support to women in need, will join Thirty-One, and guests will have a chance to sign their big pink firetruck in honor or memory of a woman. Thirty-One is bringing their opportunity to African American women through an organic outreach that meets them where they live, work and play. The company has sponsored and been involved with events, locally in Columbus, Ohio, where Thirty-One is headquartered, including the National Coalition of 100 Black Women Central Ohio Chapter, African American Male Wellness Walk, and Dress for Success. They also have branched out into national events, as sponsors of the National Urban League Conference, and the Texas Black Expo, where 20,000 and 15,000 attended, respectively. Hampton started with Thirty-One as an I.T. professional, and after seven years, created his new leadership position, drawing from his experience at the company and past success in the direct-selling industry. With experience as a business person and former professional football player, he has a passion for servant leadership. He is the grandson and son of preachers, and embraces Thirty-One’s faith-based mission. He graduated from Kentucky State University, an historically black university. Hampton is pleased and encouraged about the direction the company is taking and excited to be able to expand the Thirty-One opportunity to more African Americans. Thirty-One Gifts is one of the world’s largest direct-selling companies, offering purses and wallets, totes, baby bags, home organization solutions and décor, crafting storage, photo products, thermal bags, jewelry and more. The company, however, is about much more than its products. Thirty-One is a family of individuals who share a passion for empowering women, and who are committed to celebrating, encouraging and rewarding others for who they are. The name Thirty-One Gifts comes from Proverbs 31, of the Bible, which describes the attributes and importance of a “virtuous woman.” With a mission to help women by giving them the opportunity to own their own businesses, Thirty-One provides tools and support to help find success and possibly build a new career. From its humble beginnings they’ve grown to include more than 1,000 employees and nearly 61,000 independent sales consultants across the U.S. and Canada – many of whom are reaching their dreams through this opportunity. Giving back also is fundamental to Thirty-One. Through their philanthropic initiative, Thirty-One Gives, the company partners with nonprofit organizations that serve and support girls, women and families, and they have donated more than $100 million in product and cash to charitable organizations that share the mission.